I am not the girl who says, "It's too hot out for a heavy dessert." Please, I could eat molten chocolate torte in 110˚ heat if you asked me to. But something has happened: Whether it's old age or my Frenchy-French food training, I'm not in the mood for cake. Help! 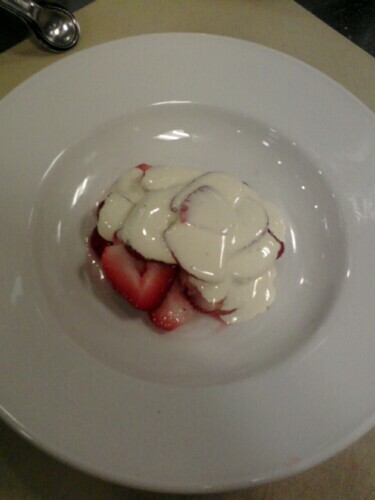 Instead, I've been craving the lighter fruit desserts we've whipped up in class. They're so much easier to make and actually quite refreshing compared to my beloved cupcakes. Am I a cheater? One of my new favorite treats is Sabayon–also know as Zabalione, for my Italian readers–a light, mousse-like custard made with eggs, sugar and wine. The mixture can be poured on top of fresh fruit, cake, even fish if you could imagine. The beauty of it is, you only need a few eggs, some sugar and whatever leftover booze you have to whip up this classy dessert. Your job is to get creative with it, mine is to share the recipe. All you need to remember is the number 3: Enjoy! 1. Prepare the "double boiler": Put some water in a small pot and bring to a boil. Reduce to a simmer. This looks delicious! Remember, absence makes the heart grow fonder - you will come back at cupcakes with a vengeance in no time. Do you make a particular holiday cupcake? Anything with warm cinnamon?